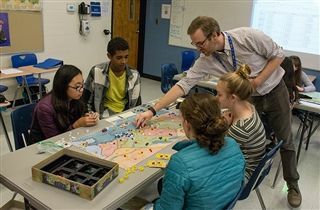 Eighth graders in Connor Bell’s social studies class have been exploring themes of the American Revolution through a board game called 1775: Rebellion. In this game, players take the roles of the American Continental Army and Patriots against the British Army and the Loyalists. Each side tries to control the colonies, provinces, and territories. According to Mr. Bell, this activity not only provides a fun way to reinforce content students have been learning in class, but also a great way to build skills such as collaboration and communication.